Rwanda has taken a cautious approach in its search for oil in Lake Kivu as it seeks to reduce costly financial risks before allowing international companies to carry out the latter stages of exploration. The government has halted bids from oil explorers for now and plans to invite them back after completing its own geological survey to establish whether it is worthwhile for the state to enter into partnerships with international oil explorers. "The stage we are at is low-cost and involves geochemical analysis in Lake Kivu through coring. Coring involves digging shallow wells that are about 10 metres deep, and testing the samples in laboratories to see if they show indications of oil," Francis Gatare, CEO of the Rwanda Mining Board told The EastAfrican. "This is aimed at capturing enough information for private companies to take it up and for government to have meaningful partnerships." He said that the there is no set timeframe for when the survey will be completed. "Oil exploration is a long process and you cannot put a timeframe to it. We are doing it as the government but there is a point at which it will only make sense for it to be done by a private company," Mr Gatare said. Sources confirmed that Ngali Mining, a local subsidiary associated with the military, has been conducting the survey on behalf of the government since early 2017. Ngali Mining also subcontracted ABI Holdings Ltd, an international explorer with ties to the UK and Cyprus, to provide the expertise and machinery needed for the geological survey. "The government is subcontracting experts from around the world and I am not at liberty to discuss their contractual issues, but we will certainly discuss with you the outcome of this oil survey exercise once it becomes available," Mr Gatare said. 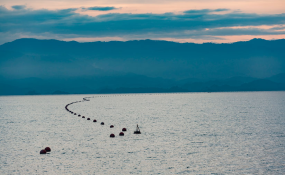 The survey is complemented by data provided by Vanoil Ltd, a Canadian company that explored for oil in Lake Kivu for four years until 2014, when the government terminated its contract. Rwanda had reopened negotiations in 2016 to resume oil explorations and signed a contract with Chinese firm BGP Oil, but the deal collapsed. BGP Oil maintains a strong presence in Africa, with oil exploration works in 10 African nations, including in the Kenya's tertiary Rift basin. Rwanda's petroleum law prevents ownership of oil fields by private companies and vests all ownership and control of petroleum in the state. An exploration licence is valid for three years, and an oil production license is valid for 25 years. The East African Rift has been a hotbed for exploration activities since the discovery of oil in the Albertine Graben in Uganda - which is north of Lake Kivu - as well as gas discoveries in Tanzania and Mozambique. A report by British firm Black Swan Energy showed that 20 oil and gas discoveries have so far been made within the Rift basin, estimated to hold over four billion barrels of oil.